Eye candy has arrived! And I have more pictures in my Flickr account, so I’ll be able to post more soon. I’m not quite sure how this entry will look when I post it, since I’m doing it through Flickr instead of WordPress. But since the picture is already posted on Flickr, I figured I’d test out their blog feature and see how it works. This is my Monarch Garden pillow top. I will probably not actually finish this into a pillow. Most likely it will either become a wall hanging or part of a quilt. My main goal with this kit is to practice some of my surface embroidery techniques. For the current UFO challenge on stitchin fingers, the goal is to finish all the leaves in the center section. I’ve got a good bit to go. 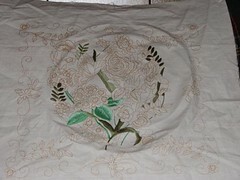 The leaves in the borders are not part of the goal, since I plan to finish the center before I do any work on the borders. This entry was posted on September 7, 2008 at 8:20 pm and is filed under UFOs, Uncategorized. You can follow any responses to this entry through the RSS 2.0 feed. You can leave a response, or trackback from your own site.